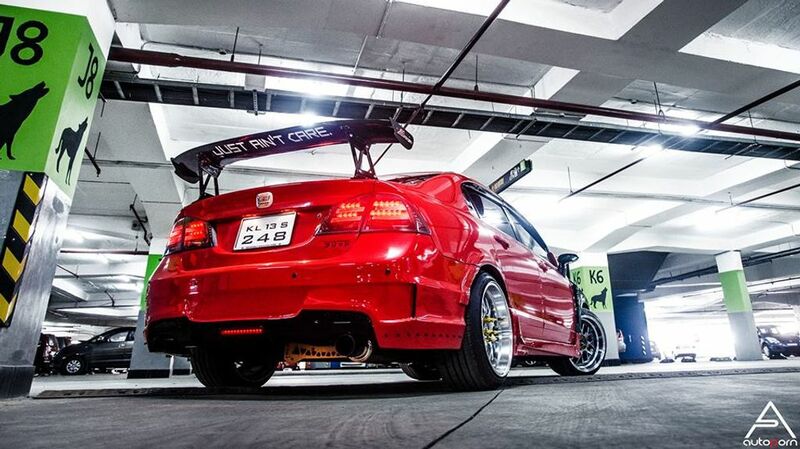 Honda Civic is one of the most popular models in modification market and we have already featured many of them. Then we stumbled upon this Civic, which is modified by 360 Motoring – Car Energising Studio based in Calicut, Kerala. The custom shop has made lots of changes to the standard Civic to make it unique. 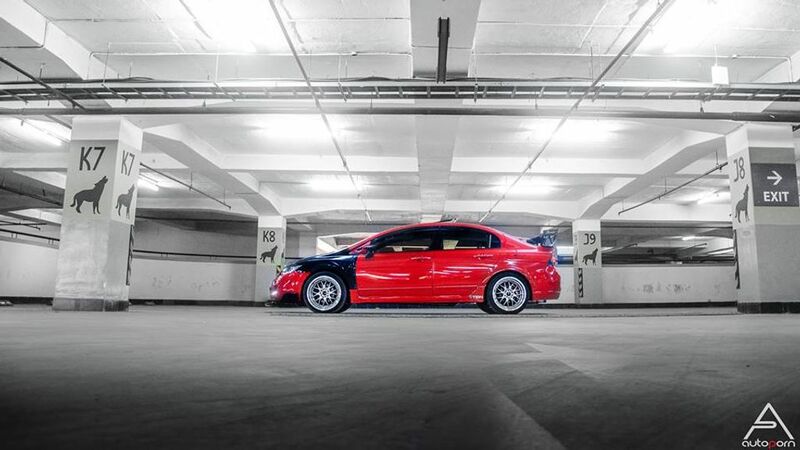 360 Motoring has given 2015 Type R imported body kit, which makes the Civic look meaner. The front gets a new custom bumper with integrated DRLs in the fog lamp housing along with carbon fibre fenders and bonnet UrbonR. The stock headlamp has been replaced by aftermarket projector units and a new grille. 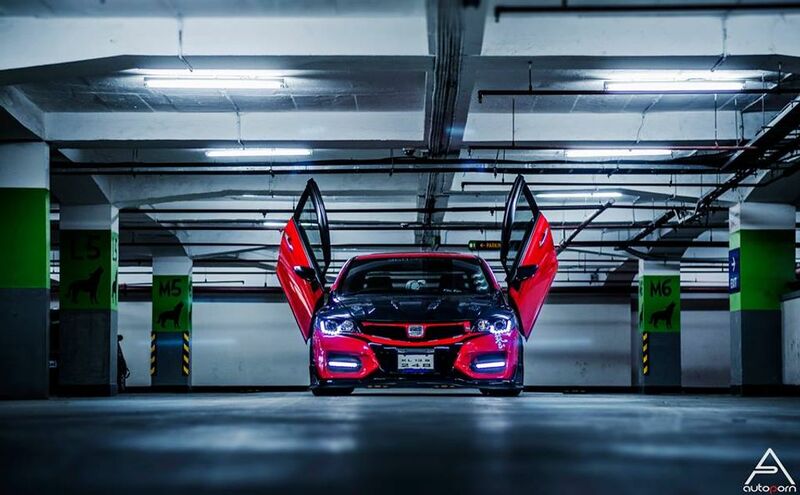 The modified Civic comes with spoon mirrors and vertical doors. The stock model already had low ground clearance and they have made it lower with Tein springs and 32 step adjustable suspension. The rear tail lamps are also aftermarket unit and the custom shop has given Js racing carbon fibre spoiler. The exterior is finished in red and black colour along with 18-inch low profile tyres. The interior also gets lots of changes, which include new custom sports seats, new metres like oil pressure and RPM (stock rpm metre is digital and this aftermarket unit is analogue unit similar to rally cars) on the dashboard. The performance upgrades start with new stainless steel performance headers, HKS muffler, Simota air-intake system, hardrace camber kit, beaks sturt bar, new performance exhaust system and more. 360 Motoring didn’t reveal the exact power figures but we can expect a good increase. The 1.8 L i-VTEC engine in stock form produces 132 PS of power at 6,300 rpm and 172 Nm of torque at 4,300 rpm. This engine is mated to a 5-speed manual and automatic transmission with paddle shifters behind the steering wheel. The total cost of modification is not yet available.